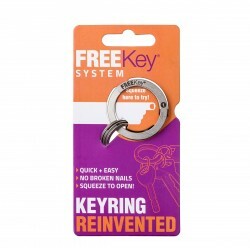 Freekey System Keyring is not just any old keyring but is designed with a patented wave to enable keys to be added without pain, broken nails or frustration. By pressing the Freekey System logo position of the Freekey System Keyring, the end part will open to release or add the key or set of keys. Ideal for carrying different sets of keys together on one keyring. To release a key from a keyring can be a frustrating and painful experience. That is why Freekey spent several years figuring out something that should have been realised decades ago – the press to open keyring. Freekey Keyring is designed with a patented wave in the middle of two turns of stainless steel flat wire. By pressing at logo position, the end part will open to release or add the key or set of keys. Designed in Sweden and manufactured in the USA from high-grade stainless steel, FreeKey rings eliminate the always challenging operation of a traditional key ring by opening with the simple press of the ring. Featuring a brilliant and simple design FreeKey rings achieve enhanced ease of operation by introducing a strategically placed bump in one of the ring loops - essentially creating a pivot that allows the end of the ring to lift when the ring is pressed. The ideal base for your EDC, the FreeKey is the ideal companion to the EXOTAC nanoSTRIKER XL .